Has your dentist recommended measures to correct crooked or misaligned	teeth? If so, he or she probably suggested visiting an orthodontist. There	are many orthodontic treatments for kids and adults. Braces and other appliances help straighten teeth so they are easier to clean,	at less risk of disease and decay, and less likely to be lost early. The range of orthodontic treatments and appliances available can treat	an overbite, underbite, crossbite, or open bite. They can be used to fill	spaces between teeth or missing teeth. These appliances may also correct	crowding in certain areas of the mouth. The information below will help you understand some of the most common	appliances your orthodontist might recommend and what they’re designed to do. 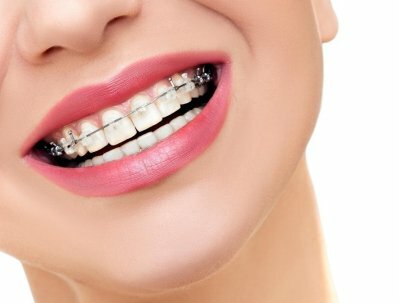 Braces: A system of brackets, bands, and wires, among other components, fixed	to teeth with cement, and one of the most common forms of orthodontic	care. While brackets are usually bonded to the front (some may be applied	to the back), arch wires pass through each of these and attach to anchors	known as bands. By tightening the wire, the orthodontist can reposition	your teeth. Treatment times range from a few months to a few years. While stainless steel is still used, some wires are made of nickel-titanium	or copper-titanium. These often don’t require as many adjustments	and can last longer. Plastic, ceramic, and, sometimes, a combination of	materials are used as well. Fixed space maintainers: These may be used to fill a space where a baby tooth was lost prematurely. An orthodontist will attach a band to the adjacent tooth. A wire is then	attached and extended across the space until the adult tooth erupts. Special	fixed appliances: Other types of appliances may be secured with bands to teeth. These are	often uncomfortable, especially while eating, and they are only used if	issues such as tongue thrusting or thumb sucking become problematic. Other appliances include the quad helix, which is attached to the molars	and uses helix springs to widen the palatal arch. A crib appliance may	be used to change tongue-thrust and thumb-sucking habits. Attached to	the rear of front teeth, tongue trainers can help close an open bite and	alleviate severe tongue thrusts. There are also various other types of	appliances designed to address different teeth and jaw positioning issues. Retainers: These prevent teeth treated with braces from shifting back to where they	were. Sometimes used to prevent thumb sucking, retainers are usually worn	on the roof of the mouth. 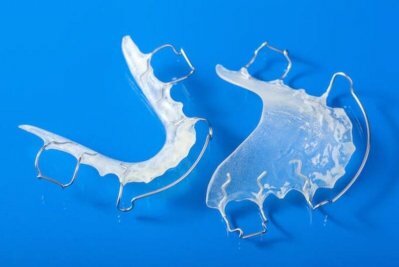 Some retainers are fixed, while clear plastic	or rubber may also be used. Removable space maintainers: These feature an acrylic base and plastic or wire branches to keep spaces	open; they can be taken out rather than being permanently fixed. Jaw repositioning appliances: Worn on the top or lower jaw, these help readjust the position in which	the jaw closes. These are a type of treatment used for people with temporomandibular	joint disorder or TMJ. Lip and cheek bumpers: If teeth are affected by pressure exerted by the lip and cheek muscles,	bumpers help relieve pressure by keeping the lips and cheeks away from	the teeth. Palatal expander: A plastic plate designed to widen the arch of one’s upper jaw,	fitting over the roof of the mouth it exerts outward pressure on bone	joints in the palate, forcing it to widen. Headgear: Strapped around the back of the head, orthodontic headgear holds rear	teeth in place, pulls back front teeth, and slows upper jaw growth using	a metal wire structure in front. It is typically removable and usually	only required at night. Rubber bands: These add force to position the teeth and jaws. They’re easily	inserted and taken out and come in different colors, which kids enjoy	matching for holidays or with their school colors. There is no typical order, as all individuals receive a treatment plan	based on their individual oral health. Depending on their needs, children	as young as 6 or 7 may receive orthodontic treatments. Your children may	not necessarily lose all their baby teeth before treatment starts. Appliances	may be used even earlier, especially for children with cleft palates and	other issues. 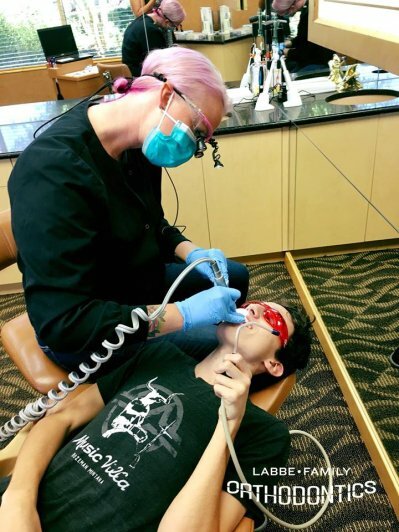 Even with early orthodontics, many kids require braces later,	or perhaps other work. The	American Association of Orthodontists recommends children be first examined by an orthodontist by age 7, but	treatment can be effective at any age. Treatment at that point may or	may not be necessary. 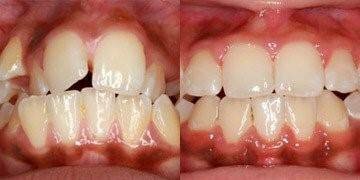 The process of moving teeth is the same no matter	what age you are. However, the best results are often seen while the jaw	is still growing, depending on the patient. Whether to choose braces over other methods, such as aligners, depends	on your individual needs and the suggestions of your orthodontist. Retainers,	as previously mentioned, help keep teeth in place after they’ve	been moved. Other appliances are used as the need for them is identified	or arises. The function of braces hasn’t changed much. However, they’ve	gotten smaller and lighter. The amount of metal visible may be less than	the braces of the past, while clear styles and even bright colors may	be available. Orthodontists can, therefore, cater to those who would rather	their braces be less visible or look more stylish or trendy. Aligners: Clear, invisible tray-like devices, like the ones commonly associated	with Invisalign®, these are a braces alternative often used in adults. Teens and younger patients may be candidates for the treatment as well. While the aligners are secured using clear, fixed anchors on each tooth,	the devices themselves can be removed to eat, brush, and floss. Each tray	is designed to move teeth using pressure, a small amount each time; a	new aligner is molded for each step of treatment. Temporary anchorage devices (TADs): These are becoming more common and provide a more predictable way to	control where teeth move. Each TAD is essentially a mini-screw. It can	range from 6-12 millimeters long and 1.2 to 2 millimeters in diameter. The idea is to provide a fixed point to apply force; this is often accomplished	by fixing the device to bone. The	evolution of orthodontic appliances has taken new and better turns in modern times. Lingual braces in a form	that resembles today’s types appeared in the 1970s. Before then,	brackets were anchored by winding wires around each tooth. That all changed	when dental adhesives came about. There is evidence of orthodontic treatment in Egyptian mummies, some of	which have metal bands secured to teeth with catgut. In the 1700s, an	appliance known then as a bandeau was used. It was a strip of metal with	spaces to fit around the teeth. This horseshoe-shaped device helped address	alignment issues like modern-day orthodontic appliances do. A pelican,	or type of forceps, was used to realign teeth forcefully, which were then	tied to nearby ones during the healing process. However, modern appliances are far less invasive. Dental technologies have	evolved, and orthodontic services are designed to be more effective and	comfortable for the patient. Labbe Family Orthodontics has convenient locations in Annapolis, Crofton/Gambrills,	Bowie, and Greenbelt, MD. Whether you’re looking for an orthodontist	for your child or the entire family, you will find a local orthodontist	who is committed to personalized treatment and one that provides convenient	in-house financing, prioritizing orthodontic care, including	braces and Invisalign. Schedule a complimentary consultation, with x-rays and	a thorough examination, by contacting us online or at 443-603-3448.